What is a sound level meter? A sound level meter is a handy equipmentÂ used to display sound levels. There are wide ranges of these devices; some show a digital numerical output of how many decibels of sound is created while some other shows a bar graph indicator (the decibel meter you see in mission impossible 1 movie). Here in this project, we are going to construct a sound level meter which displays a bar graph using 10 LEDs. This is a one-chip sound level meter that can be used for displaying the sound level of an amplifier or simply the sound level from a microphone. The heart of the circuit isÂ IC LM 3915 Audio level IC. Even though it is a stand-alone IC, a peak detector based on Transistor BC 558Â and diode 1N4001Â is also included for better performance. Supply voltage can be from 3V to 20V. The input is set for audio line voltage (1V peak to peak) and has a max input voltage of 1.3V.Â Â To make the circuit use a moving dot display instead of bar graph display, Pin 9 can be should be disconnected from +V. 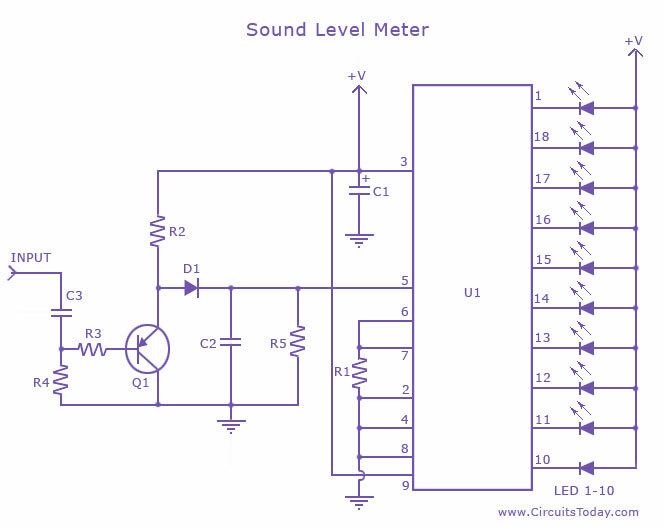 Sound Level Meter Circuit Diagram. I need to build a current level indicator with colors leds showing the current level. Seeing your circuit above I guess that maybe it could be adapted to my needs. So I ask you if you have a specific circuit to meet my needs or if you can give me directions to change this one to my needs. Does it work with a PC. And if not, how sould I change it? Try to connect 2 9v bateries in series. This IC needs more power to work fine. This circuit will work just for one channel. Chose left or right and connect it at the “input”. The ground must be connected to the ground of the circuit. hey there, ive tried your way, but i have a huge problem!!! as i connect the “project” to 9v, only 7 of my leds work(which is stupid cause they are working great!) other thing is it does not react to sound!!! what could be the problem? and in this circuit, input ? what does it mean? cause in the input there is 3 ,ground left and right… what is the right way to connect them?